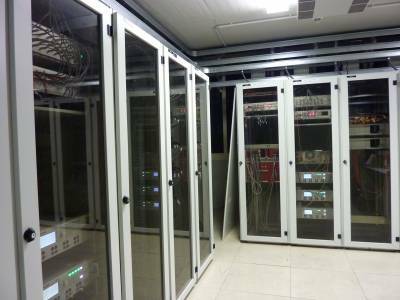 Series of electronic racks with Virgo devices used to control suspensions of minitowers, to acquire the signals from photodiodes and cameras of suspended optical benches, to supply the power to these sensors, to acquire some environmental probe siignals, etc... 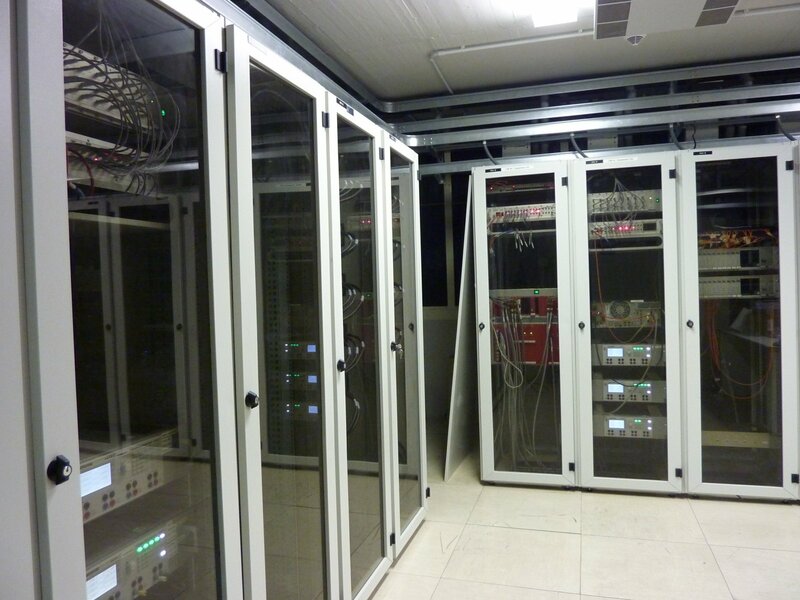 The digital data acquired in the whole Virgo experiment are routed inside the data network using multiplexers/demultiplerxers located in this room. 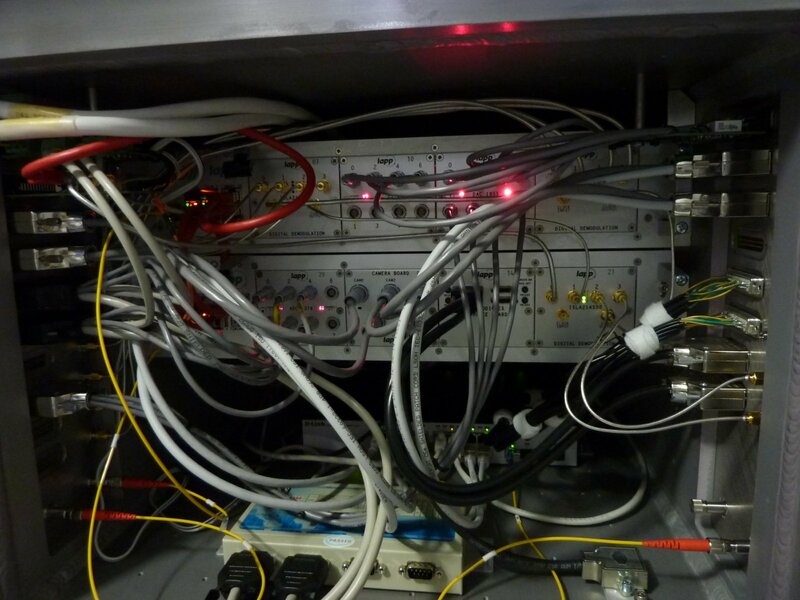 Three racks hosting the electronics to control the superattenuator where a bench used to acquire the interference pattern is suspended and the electronics to control the optical elements installed on this bench. On the background, vacuum enclosure of superattenuators are visible. Optical fibers are used to acquire and transmit the digital data from sub-systems to sub-systems over the whole Virgo interferometer. 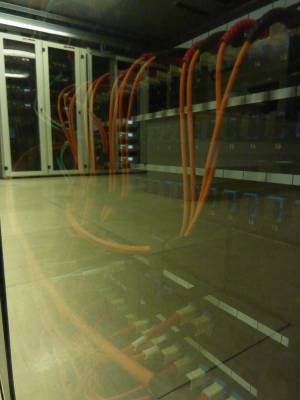 Patch panels are used to ease the optical fiber installation. Electronics racks are visible in reflection on the door. 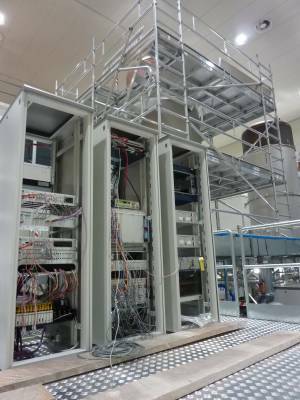 Electronic devices installed inside a tight "air-box" below an Advanced Virgo bench to be suspended and placed in vacuum. 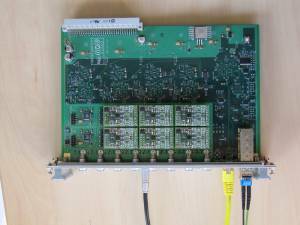 This custom electronic board is able to digitize 16 voltage signals measured by the Virgo detector at sampling frequencies of few tens of kilohertz in general. The ~35 boards used in Advanced Virgo are all synchronized on the GPS time within 50 ns.